Stevie gives lengthy interview on DVD release date…. April 2, 2013…IYD Screening on 50 Screens in North America (click for list)…. IMO: Stevie Nicks is very smart. She is funny. Stevie is immensely talented. Miss Nicks is strong. She is a survivor. Stevie Nicks does not like to be told what to do. Stevie Nicks is the boss. Stevie is a caring and loving human being and this claim has been demonstrated by her acts of goodness and selflessness. Stevie is a poet. A singer. Stevie was/is a loving daughter and family member. Stevie Nicks is a life-long friend to a few lucky people. After attending two Q&A sessions (and viewing her documentary) this weekend I learned first-hand that Steve Nicks is a real person with a lot more substance than I thought was even possible. I chatted with her briefly about The Wiltern Show and shook her hand. I thanked her-that word, thanks, is small but is so very full of life-long emotions and memories. Many in attendance at these special New York events were awestruck by Stevie Nicks’ candor, style, class, and iconic stature. Stevie Nicks will forever be a force rarely matched. 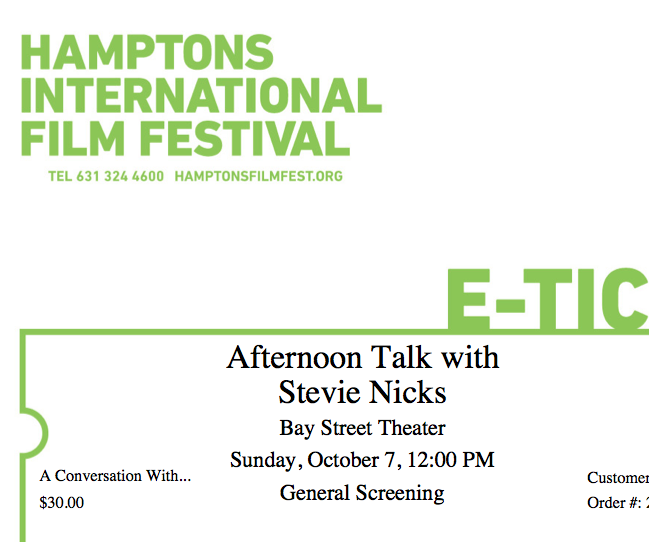 10/7/12: Hamptons International Film Festival – WORLD PREMIERE I’ve got tickets…Can’t wait for the WORLD Premiere and Q & A ! Nicks credits her fans and their support or allowing her to tirelessly tour and promote “In Your Dreams” and help her make it the modern day music business success that it is. As such, she pointedly thanked those in attendance for their part in it. 10/12/12: Mill Valley Film Festival – In Your Dreams: Stevie Nicks (Second screening added). Read Dawn Watson’s interview with Stevie Nicks in “27East”/ Hamptons…. This entry was posted on Friday, September 14th, 2012 at 9:52 AM	and tagged with #hiff2012, 4/2/13, a conversation with, AHS, american horror story, austin, bay street theater, bundle, cancer, coven, dave stewart, dawn watson, download, dvd, ejaf.org, elton john, eurythmics, fashion, grammy, hamptons, hamptonsfilmfest.org, headley grange, hiff, hollywood reporter, http://schedule.sxsw.com, icon, in your dreams, inyourdreamsmovie.com, jacob burns film center, janet maslin, karen johnston, las vegas, led zeppelin, legend, lily rabe, lindsey buckingham, lori nicks, mariah carey, marin, meryl streep, Mike Ragogna, mill valley film festival, Misty Day, mvff, Nicki Minaj, north america, one night only, oscar, pacific palisades, paul liberatore, q&a, reprise, review, rock, second screening, sharon celani, signed, sin bin, south by southwest, stevie nicks, sunset sessions, sxsw, the grove, Tiff, warner, www.burnsfilmcenter.org, www.mvff.com and posted in Film/TV, Stevie Nicks. You can follow any responses to this entry through the RSS 2.0 feed. « ‘Women Who Rock: Vision, Passion, Power’ Comes To National Museum Of Women In The Arts : Stevie Nicks et. al.